This Presbytery of Western Australia newsletter is for congregations, by congregations. It is published bi-monthly on the second Tuesday of the odd months of the year (except January). Email Hands and Feet to share your inspiring stories. The deadline for contributions to the July edition is Monday 26 June. 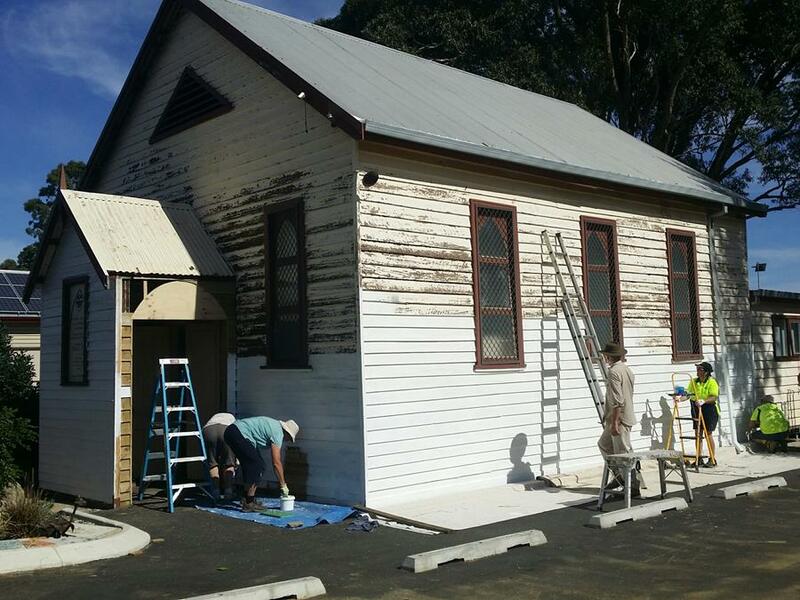 Mundijong Heritage Uniting Church is undergoing a major facelift. Many of the old timbers are being replaced and the whole exterior is getting a much needed coat of paint to freshen it up, as it was last painted in 1990. Providing our small volunteer group with some extra help will be a dozen volunteers from the organisation Mobile Mission Maintenance (MMM). MMM is a mission organisation operating throughout Australia and neighbouring countries which supports Christian ministries by providing building, maintenance and other practical services, making a real difference to people’s lives. In 2015, MMM visited and provided us with expertise and volunteer labour to re-line the interior of the chapel. In 2016, we were assisted in remodeling the old kitchen into a Kid’s Zone and installing a new kitchen into an adjacent room. We are so glad they are able to visit us again in the ongoing restoration. A worship service celebrating the beginning of the restoration works was held on Sunday 30 April. Volunteers from MMM were present, Rev David de Kock, general secretary of the Uniting Church WA, shared a message and the Tongan Youth Band from Beth Shalom Tongan Uniting Church led us in song. Ashes are what things shall return to. 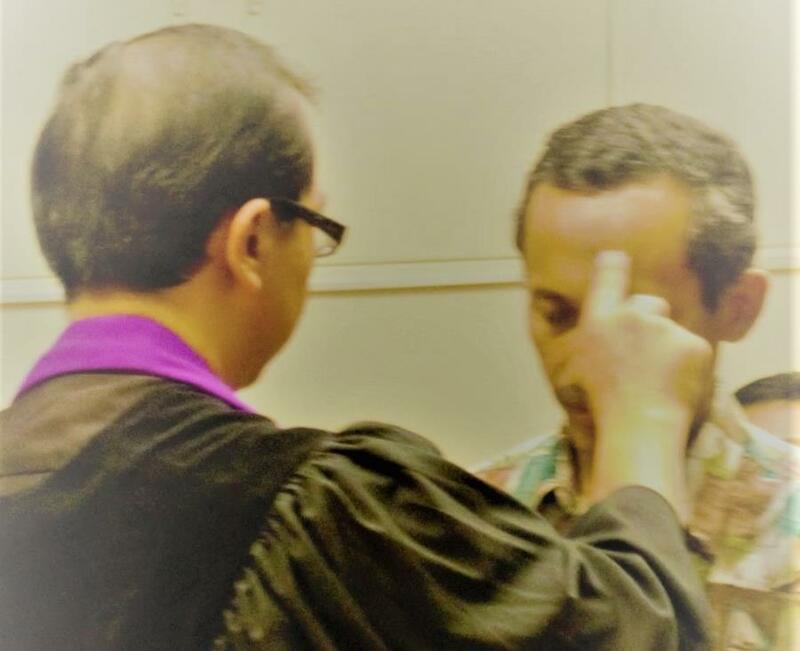 We, GKI Perth Uniting Church (Indonesian), remembered this on the first day of Lent, Ash Wednesday. The practice was to solemnise repentance and believe in the Gospel. Applying ashes on the head has been used to express grief and in this occasion, sorrow for our sins. We marked a cross on our head, symbolising the start of the season for self-examination and reflection. We commemorated Holy Thursday this year through the practice of Taize prayer. The name is obtained from a Christian community in France that unites through different church traditions. We conducted Taize prayer through contemplative worship, sung repetitively, blended with a period of silence and liturgical readings. An arrangement of candles was shaped as a cross in the middle of the church. Through the meditative form, we sought spiritual experience through remembering the Last Supper of Jesus Christ. 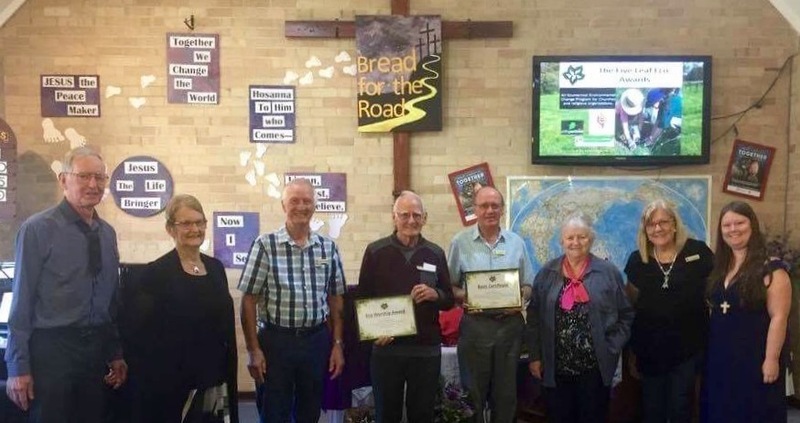 Solar panels, energy efficient measures, recycling and composting play an important part in eco-thinking at Pinjarra Uniting Church. The church has a long-term commitment to a sustainable future, so that our children and grandchildren learn to care and commit to looking after this wonderful world we have been given to live in. The parish received the Five Leaf Eco Award from Jessica Morthorpe at a service on Sunday 19 March, which was the beginning of our journey to try and achieve the next level of achievement. The Five Leaf Eco Awards are a religious environmental change initiative that aims to inspire and reward churches across Australia to be committed to environmental education and action. Churches have an important part to play in caring for the environment. There are many ways we can be more energy sufficeint such as participating in Sustainable September, recycling, creating less waste and living more in tune with nature. For several years, Wanneroo Crossways Uniting Church has expressed this name by sharing worship between Fijian and Anglo members. 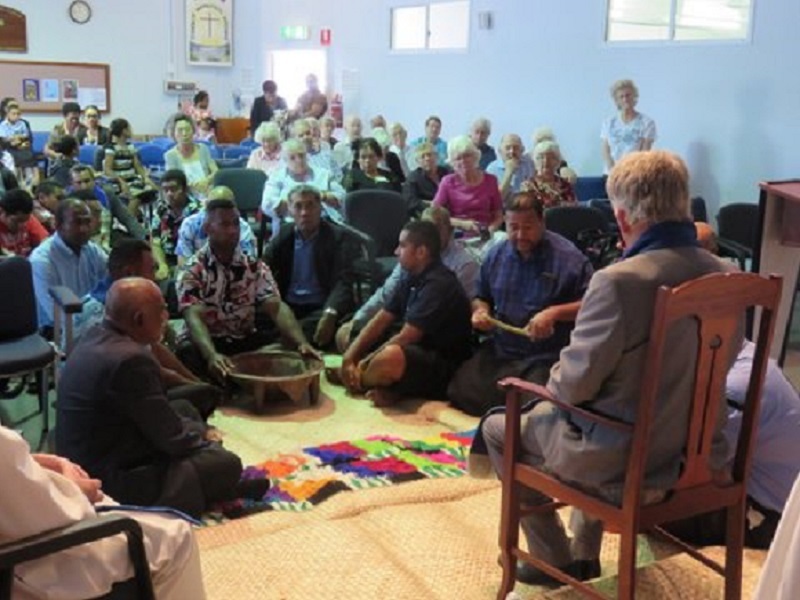 Since last May, Rev William Lucas, a retired minister of the Methodist Church in Fiji who is now living in Perth has encouraged Fijian folk to share worship in the Fijian language, twice each month. With the support of Rev David de Kock, general secretary of the Uniting Church WA, and Rev James Bhagwan, secretary for communication and overseas mission of the Methodist Church in Fiji, Sunday 12 March became a service of celebration for the transfer of more than fifty members from the Fijian Methodist Church into the Uniting Church in Australia. This accords with the Memorandum of Understanding between the two churches. The cross-cultural character at Crossways is expressed through Fijian and English language services being open to all, as well as engaging in Church Council responsibilities. For special occasions worship is joined, with songs and readings in both languages and lunches shared together. Children and young leaders from Forest Lakes Uniting Church Faith Community in Thornlie have been attending Kids' Camp Out (KCO) for many years. I recall first being an adult leader in 1997 when my children were small, only my son Alex was of camp age, but my girls Ailsa and Anna came along at 5 and 3 years old. I was a member of the organising committee for much of that time too, only ‘retiring’ last year. The group has changed over the years as the ages of the children have changed, initially a large group of 7 to 12 year olds, to now being Junior Leaders and Young Adult Leaders. Forest Lakes Uniting Church, although small, is committed to encouraging the inclusion of everyone in all church activities. Through mentorship and financial assistance, the congregation supported their young leaders to take on responsibility in the wider church, and they in turn are encouraging family and friends to do the same. The Forest Lakes’ mums, dads and grandparents actively support the group each year to attend KCO, through being organisers and adult leaders for the weekend, preparing crafts or activities for the campers, or providing camping equipment and food. This year, Forest Lakes’ ‘kids and friends’, made up a large proportion of First Third’s KCO Organising Committee taking on the responsibility of leadership throughout the camp, and even though they were eligible to look after themselves at camp, they requested that I be their ‘Camp Mum’ for the weekend, a role I enjoyed immensely, supporting not only those who belonged to Forest Lakes, but also a few extras who needed a bed, a cup of coffee, or a piece of cake.